Last July 2016, European Commission revealed that MAN, Daimler, Volvo/Renaul, Iveco and DAF agreed to fix a high price to trucks. coordinating prices at “gross list” level for medium and heavy trucks in the European Economic Area (EEA). The “gross list” price level relates to the factory price of trucks, as set by each manufacturer. Generally, these gross list prices are the basis for pricing in the trucks industry. The final price paid by buyers is then based on further adjustments, done at national and local level, to these gross list prices. 1 ¿What kind of trucks are affected? 2 ¿What Can I claim? 3 ¿Who and Where you can claim? ¿What kind of trucks are affected? Of course, every case is different, and we need to handle every single claim. But in general, you can sue if if you bought a truck over 6 tones between 1997 and 2004, the any of the following companies: MAN, Volvo, Daimler, Iveco, DAF and Scania. The companies agree to fix a high price to trucks over 6 tones. It means that it can be claimed the difference between a real competitive price and the price already paid by the buyers. Notwithstanding it will be necessary a technical and economic evidence to submit before the Court, what generally can claim is around 15-25% of the price of the bought. ¿Who and Where you can claim? As the European Commission has established, any person or firm affected by anti-competitive behaviour as described in this case may bring the matter before the courts of the Member States and seek damages. The case law of the Court and Council Regulation 1/2003 both confirm that in cases before national courts, a Commission decision constitutes binding proof that the behaviour took place and was illegal. Even though the Commission has fined the companies concerned, damages may be awarded without being reduced on account of the Commission fine. The Antitrust Damages Directive, which Member States had to implement in their legal systems by 27 December 2016, makes it easier for victims of anti-competitive practices to obtain damages. 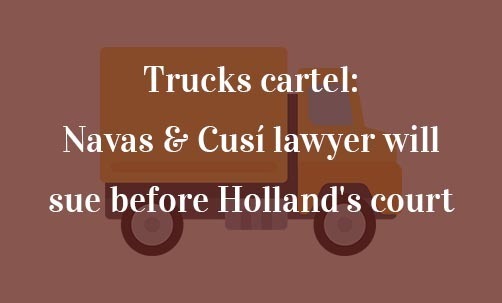 In Navas & Cusí Lawyers we think the most effective way is to submit a lawsuit before the Court in Amsterdam. 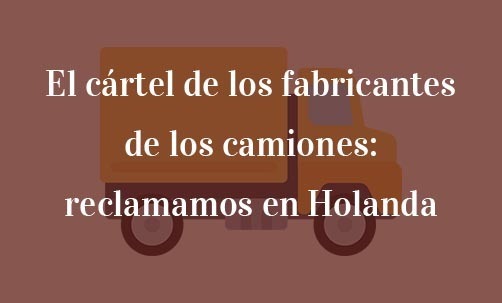 In Holland there is specialized court in anti-trust who is going to manage the truck claim easier than other jurisdictions. If you bought a truck over 6 tones between year 1997 and 2004, please do not hesitate to contact us and to join the action before the Court in Holland in defend of you interests.